EDINBURG — A jury sentenced an 85-year-old former priest convicted of murder to life in prison Friday afternoon, wrapping up a case nearly six decades in the making. 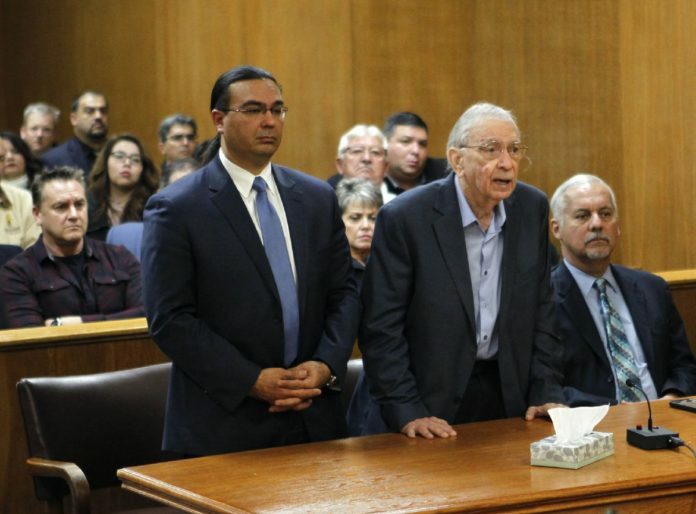 The prosecution had initially asked the jury to sentence Feit to 57 years, which is symbolic of the time he’s lived as a free man since killing 25-year-old schoolteacher Irene Garza during Easter weekend in 1960. Lead prosecutor Michael Garza said Feit was “having a family, getting married, hiding behind the protection of the church, mocking the system because he got away with murder” during this time. “You can decide for yourself what kind of death Irene suffered … not being able to breathe,” Garza told the jury before they deliberated the sentence. The 25-year-old schoolteacher never returned home from going to confession at McAllen’s Sacred Heart Catholic Church on April 16, 1960. Her body was pulled from a canal five days later, and an autopsy report revealed she had been beaten, raped while unconscious and asphyxiated, likely by suffocation. “By your verdict and your assessment of punishment you remind him of what her name was; her name was Irene Garza,” the prosecutor said, a reference to statements the then-27-year-old Feit gave to police in 1960, claiming he did not know the victim. Feit’s lead defense attorney, O. Rene Flores, asked the jurors not to avenge the victim by inflicting harm on the defendant. “Does he realistically believe that John Feit will live 57 more years?” Flores asked of the prosecutor’s sentence request for the octogenarian. Flores noted that since 1960, Feit had not been convicted of a felony, which was why the defense had submitted a request for community supervision, also known as probation. Feit often wore hearing aids throughout the trial but chose not to wear them when state District Judge Luis Singleterry read the sentence; however, he did respond in the negative, when asked if he had anything to say. As Feit was being led out of the courthouse Friday, defense attorneys refused to answer questions about whether an appeal was imminent.